Have hereby agreed to establish the Tafari Makonnen School Alumni Association in North America (TMSAANA). Article I: Date of Establishment. 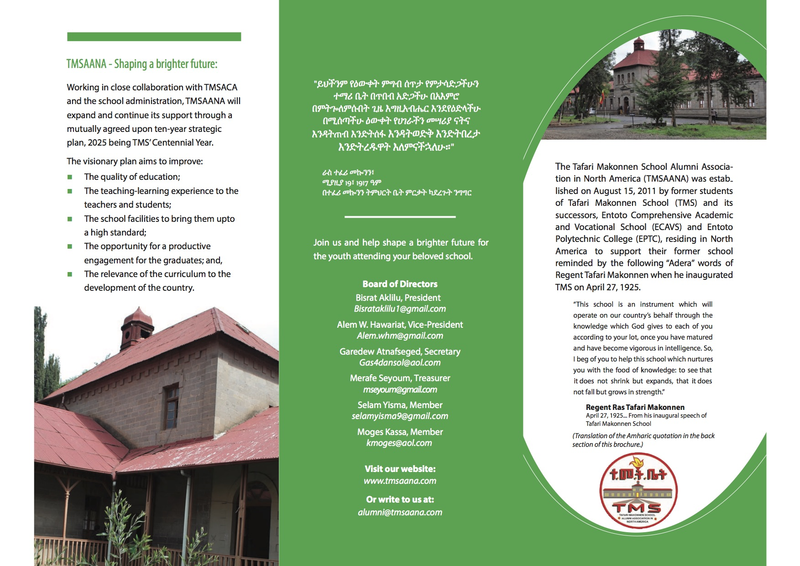 The Tafari Makonnen School Alumni Association in North America was established on August 15, 2011, following the approval of the Bylaws by two-thirds of alumni registered as of August 14, 2011. The Tafari Makonnen School Alumni Association in North America ( referred to herein after as “The Association”) is founded by and for the former students of Tafari Makonnen School and its successors (ECAVS and ETVTC), residing in North America. 3. To identify specific projects aimed at enhancing the quality of education, and develop Alumni Visitors’ Program to share knowledge and experience with our former school. Section 1. Regular Members: Former students of TMS, the renamed ECAVS and ETVTC residing in North America are eligible. Section 2. Associate Members: Former local and foreign Teachers and Administrators of TMS, ECAVS and ETVTC are eligible. Section 3. Distinguished Members: Anyone who has made and willing to make notable contribution to TMS and recommended by an Association member and approved by a simple majority vote of the Board of Directors is eligible. iii) participating in and supporting the annual work program of the Association. i) Regular members will pay an annual membership fee of $120 per member. ii) The Association will collect financial contributions from regular members to finance approved annual work program. Based on the General Assembly’s approved work program and budget, the Board of Directors will notify the members and collect contributions to implement the approved project(s). Members shall make their contributions within one month of the Board of Directors’ notification. Section 2. Associate and Distinguished Members may, on their own volition, make contributions for approved project(s). 1. The General Assembly The General Assembly (GA) shall comprise Regular Members and shall be the supreme decision making body of the Association and shall alter or amend the Association Bylaws by a simple majority vote of all members. The GA will also elect a five-member Board of Directors (BoDs) among regular members in good standing. The GA will meet every two years and hold virtual meetings in the interim years to approve the BoDs’ annual work program and budget and other key issues requiring the GA’s approval. 2: The Board of Directors The BoD will be responsible for the planning, implementation, monitoring and reporting of the Association’s Annual Program. The BoDs will present an Annual Work Program and budget to the General Assembly for approval. A. President: The President of the Association shall preside over all businesses of the Association and shall be the primary spokesperson for the Association. The President may designate sub-committees comprising regular members for special assignments. The President will also assign Regional Contacts of the Association representing the core regions of North America. B. Vice President: The Vice-President of the Association shall act in the in the absence of the President. The Vice-President will also act as the BoDs’ liaison with the Regional Contacts and will lead the drive for TMSAANA membership. C. Secretary: The Secretary shall be the official recording secretary of the Association, conduct the general correspondence of the Association, and maintain the official records including membership records of the Association. The Secretary shall process applications for associate and honorary membership and present to the BoD for consideration and will announce meetings of the General Assembly. D. Treasurer: The Treasurer shall be responsible for all funds of the Association and shall oversee the receipt and disbursement of the monies of the Association, subject to the approval of the BoDs. The Treasurer shall present an annual financial statement and a proposed annual budget to the BoDs and shall provide other financial records and reports as requested by the BoDs. The Treasurer shall not disburse funds without the approval of the BoDs. The Treasurer, jointly with the President, will open a Bank Account in the name of TMSAANA and all withdrawals will require the signatures of both Officers. 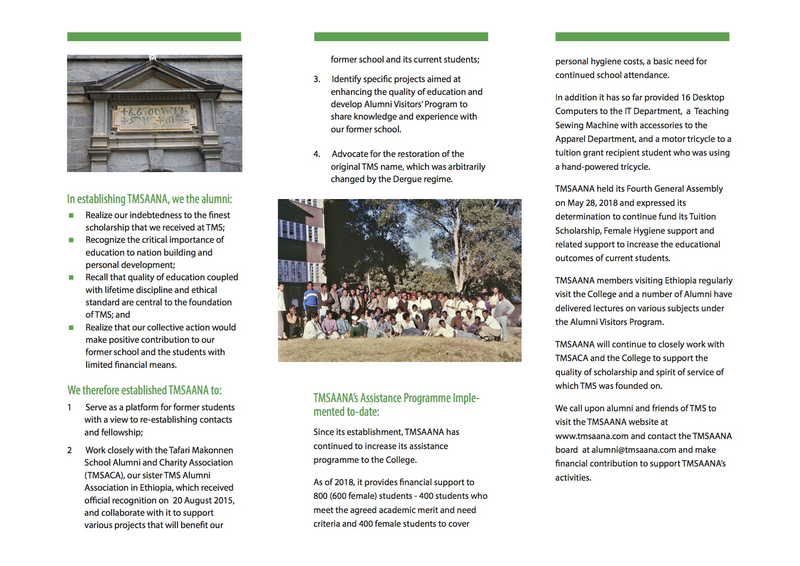 E. Website Administrator: The Website Administrator shall maintain the Association’s registration Website: www.alumni@tmsaana.com (or other websites that the BODs may create) and post the BoDs’ messages, News Letter, etc. All postings in the website will require the approval of the President. Section 2. Election Members of the BoDs shall be nominated and elected at the Association’s GA meeting except the first election of BoDs which will be conducted virtually . To maintain continuity and staggering of the Board members, the President, the Secretary and the Web Administrator will be elected for three years while the Vice-President and the Treasurer will hold a two-year term. Section 3. Termination Any Director of the Association may be removed or suspended for cause adversely impacting the Association after a motion made and carried by a simple majority vote at a duly noticed Board meeting, followed by two weeks written notice of intent to take such action, and a vote carried at a subsequent Board meeting by a two-third majority of the Board. Three members of the BoDs shall constitute a quorum for the purposes of voting. Either the President or Vice-President must be present for the quorum to be met. All votes shall be decided by a majority except as required under Article VII Section 3. Section 5. Meetings The BoDs shall meet at least twice a year, at such date and place or virtually as shall be fixed by the BoDs. Meetings may be also called upon a petition to the President of the BoDs of any three members of the Board or twenty five percent of the members of the General Assembly who are in good membership standing. Article VIII. Regional Association Chapters The BoDs may authorize, charter, license, and dissolve Regional Association Chapters of TMSAANA throughout the United States and Canada to promote the purposes of the Association. Article IX. Fiscal Year and Annual Budget The fiscal year of the Association shall be from January 1st to December 31st. The BoDs shall prepare a budget for each fiscal year for the purpose of estimating the Association’s income and anticipated expenses. An amount not exceeding ten percent of the contributions collected annually will be reserved for the Association’s operating expenses including website management. Article X. Audit The General Assembly, may request a financial audit of all books and records pertaining to the Association. Article XI. Dissolution This Association may be dissolved by a unanimous vote of the General Assembly. In the event of dissolution of the Association, any assets held for its use from donations, sales, program receipts or other sources shall be granted to the TMSAA in Ethiopia or as may be determined by a unanimous vote of the General Assembly.